Some friends of ours had their first baby this week and I knit a little sweater to commemorate the occassion. I used a pattern called Child's Placket-Neck Pullover by Joelle Hoverson. The pattern is published in the book Last Minute Knitted Gifts and at http://www.purlsoho.com/. I did make a few modifications to the original pattern. The number of stitches I cast on for the waistband was divisible by four, so I could work the band in 2x2 ribbing rather than seed stitch. I made the 6-12 month size, but since I am generally a pretty tight knitter, I used size 8 needles (I also hope that it will be more of an 18 month size). So, I cast on 112 stitches for the waistband and increased by 1 stitch in the body. I also adjusted the number of stitches for each sleeve cuff (32 stitches) and increased by 1 stitch in the first row of stockinette. For the placket of the sweater, I kept 5 stitches of seed stitch at the both ends of the rows. I'm pretty sure that when I started the collar I had 58 stitches total: 10 in seed stitch, 48 in 2x2 ribbing. I also added two buttonholes to the placket (3 stitches long each). After seaming, weaving in yarn ends, and sewing on the buttons the sweater is ready to be shipped to Michigan. I was really impressed with the yarn we selected for this project. Lily Sugar n' Cream, 100% organic cotton. It's machine washable and super reasonably priced. This was my first full sweater and I'm pretty pleased with the way it turned out. I will say that I ended up with several rather large gaps under the arms where the sleeve stitches were held, but I just stitched them up with yarn and it's barely noticeable. 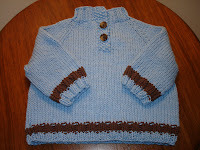 I'm hoping that little Kellan will be able to wear this sweater in his second fall/winter. Fingers crossed! This was a great pattern, especially for newer knitters because it incorporates so many techniques (kitchener stitch, anyone?). If you have a little one to knit for, give this pattern a try. I think it would be appropriate for a girl, too. Maybe with lacey cuffs and waistband. I also think this sweater would be cute with a design knitted on the back. A skull and crossbones for your little rocker? Be creative and enjoy! It is a wonderful sweater! Destined to become an heirloom!